Review Samsung has put itself in the frame as a serious cameraphone contender with the SGH-G800, a five-megapixel cameraphone sporting a 3x optical zoom plus face-detection and autofocus technology. Samsung's SGH-G800: a serious contender? Samsung has already hit the five-megapixel cameraphone mark in Europe with its stylish G600 - reviewed here. The G600 squeezed its camera into a standard frame, but the G800 has been built from the ground up with the camera as the key element of the phone. That said, it’s also equipped with the latest 3G HSDPA connectivity, meaning maximum download and surfing speeds of up to 7.2Mb/s if your mobile network operator supports it. Unlike the 2.5G G600, all the regular 3G download and streaming features are available on the G800, plus face-to-face video calling courtesy of a secondary camera above the display. With internal user memory of up to 110MB there’s enough storage for plenty of high-resolution images, or a few albums’ worth of MP3s. Swappable Micro SD cards of up to 4GB are also supported if you want a capacity boost. There's an FM radio with RDS along with the digital music player. The inclusion of the internal 3x optical zoom mechanism inside the phone’s body results in a chunky device, a departure from Samsung's recent skinny models. Its official dimensions are 101.5 x 52 x 18.8mm, though this doesn’t seem to include the sliding lens cover on the back, which adds a few millimetres more to the G800's overall girth. 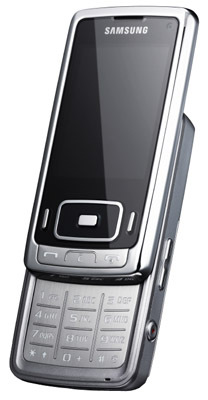 Weighing in at 129g, the G800 is slightly heavier than the comparably-sized Nokia N95. While the bulk-factor hasn’t stopped the N95 hitting the bestseller list, the G800 doesn’t have quite the same heavyweight specs – such as built-in GPS and dedicated music controls - even if it does have that optical zoom edge.